Nonprofits interested in learning more about how to better market their organizations may find help through a breakfast learning series presented by the University of Notre Dame. 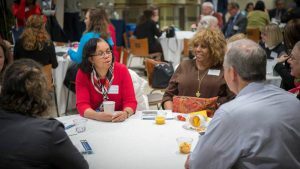 Notre Dame’s Nonprofit Breakfast Series, an annual educational program for nonprofit professionals, kicks off Feb. 19 with this year’s series focusing on nonprofit marketing. Organized by the university’s office of public affairs and Notre Dame’s Mendoza College of Business, the series will examine marketing concepts and strategies typically thought to apply only to for-profit businesses. Topics will range from branding and brand protection to message control, market segmentation and consumer input. Sessions will take place from 7 a.m. to 9:30 a.m. in Jordan Auditorium, Mendoza College of Business, on separate Tuesdays in February, March, April and May. The series cost is $100 per person. Feb. 19: “Communications/Marketing in the Nonprofit Sector,” featuring Joe Urbany, professor of marketing at Notre Dame. March 19: “Understanding and Harnessing Your Organization’s True Value Proposition,” featuring Peter Ashley, director of communications for the Hospice Foundation and president of Lime Street Communications. April 16: “Social Marketing,” featuring Liz Harter, social media program manager in the office of public affairs and communications at Notre Dame. May 14: “Marketing Strategies on a Limited Budget,” featuring a panel discussion with marketing professionals moderated by Scott Tingwald, managing director of marketing communications in the office of public affairs and marketing at Notre Dame.